Clean CARFAX. Heated Seats*, LEATHER SEATS*, Backup Camera *, Cold Weather Package*, Chrome Wheels *, Tow Package*, Wood Trim Package*, Heavy Duty Trailer Package*, 4D Crew Cab, Power Stroke 6.4L V8 DI 32V OHV Twin Turbo Diesel, TorqShift 5-Speed Automatic with Overdrive, Ingot Silver Metallic, Medium Stone w/Vinyl 40/20/40 Split Bench Seat, 4 Speakers, 5" Chrome Tubular Step Bars, Accent Color Lower Bodyside Moldings, AM/FM Stereo w/Single CD & 4 Speakers, Automatic temperature control, Body Color Exterior Door Handles, Bumpers: chrome, CD player, Chrome Package, Console, Delay-off headlights, Driver door bin, Front Bucket Seats, Front Center Armrest, Front dual zone A/C, Fully automatic headlights, Heated door mirrors, Heated front seats, Lariat Plus Package, Leather Seating Surfaces 40/20/40 Split Bench Seat, Leather steering wheel, Memory seat, MP3 decoder, Outside temperature display, Overhead console, Panic alarm, Passenger door bin, Power door mirrors, Power driver seat, Power windows, Rear Splash Guards/Mud Flaps, Rear-View Camera, Security system, Split folding rear seat, Steering wheel mounted audio controls, Tough Bed Spray-In Bedliner, Traction Control. 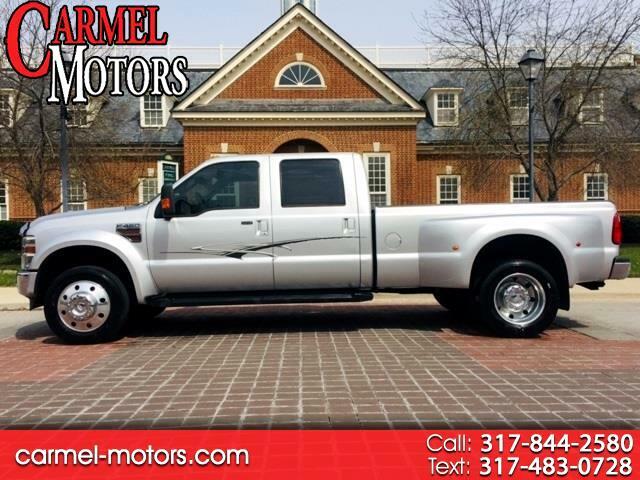 Ingot Silver Metallic 2010 Ford F-450SD Lariat DRW RWD TorqShift 5-Speed Automatic with Overdrive Power Stroke 6.4L V8 DI 32V OHV Twin Turbo Diesel We Offer the Best Automotive Finance and Loans for Good and Bad Credit "GUARANTEED APPROVAL". Odometer is 7085 miles below market average! Awards: * 2010 KBB.com Brand Image Awards Let Carmel Motors show you how easy it is to buy a quality used car in Carmel. We can arrange shipping to anywhere in the country at our discounted rates. We believe fair prices, superior service, and treating customers right leads to satisfied repeat buyers. SERVING ALL SURROUNDING CITIES OF CARMEL, FISHERS, WESTFIELD, MCCORDSVILLE, FORTVILLE, NEW PALESTINE, NEW CASTLE, GREENFIELD, GREENWOOD, MUNCIE, YORKTOWN, MARION, GAS CITY, SPENCER, CICERO, KOKOMO, LAFAYETTE, COLUMBUS, NASHVILLE, BROWNSBURG, AVON, BLOOMINGTON, MARTINSVILLE, BEDFORD, JASPER, WASHINGTON, EVANSVILLE, VINCENNES, GARY, CROWN POINTE, SHELBYVILLE, MERRILLVILLE, CRAWFORDSVILLE, WEST LAFAYETTE, FT WAYNE, SOUTH BEND, ELKHART, HAMMOND, RICHMOND, CINCINNATI, LOUISVILLE, CHICAGO, NASHVILLE, TENNESSEE, EDINBURGH, TERRE HAUTE, SHERATON, MONTICELLO. Message: Thought you might be interested in this 2010 Ford Super Duty F-450 DRW.